For students heading back to school in the fall, finding a great place to live is no easy feat. That’s why Andrea Arbuckle of Mosaic Student Communities was certain that virtual reality would be a game changer for her business. I followed VR developments at Oculus and Google and was convinced that VR could enable us to serve our students better. Every fall, thousands of students go through a mad rush to locate and secure housing for the upcoming year. VR allows us to show more housing options in a shorter amount of time. With inventory around UC Berkley, USC, and Cal Poly Pomona, Mosaic manages housing for over 700 students. And now, Mosaic is using Transported to create and publish VR tours for their properties. Transported has made it fast, simple, and cost effective to get our inventory into VR. And the VR customer experience is really amazing. 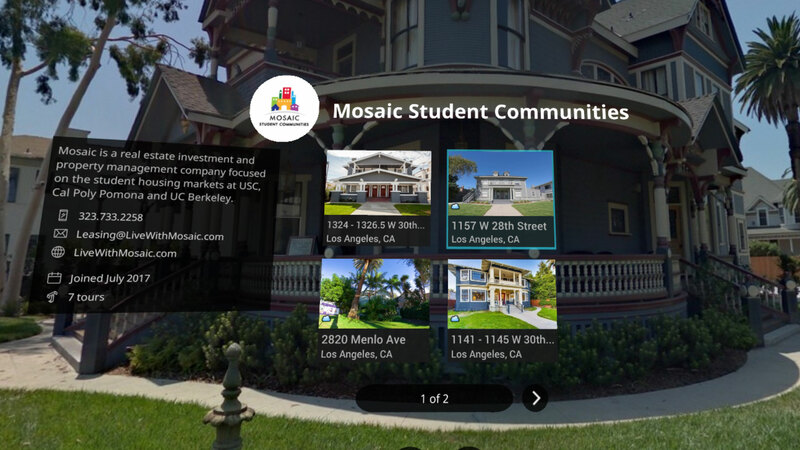 At USC, Mosaic has installed a “VR shopping experience” in their leasing office. Students come in and can tour a dozen or more homes in VR in about an hour. Mosaic doesn’t have to worry about scheduling appointments, sending a manager all over the city to give tours, dealing with no-shows, and disturbing existing residents. Students love it for the same reasons. They are used to using technology to help them shop for just about everything else. Finding a place to live is just another task made more convenient by an app.